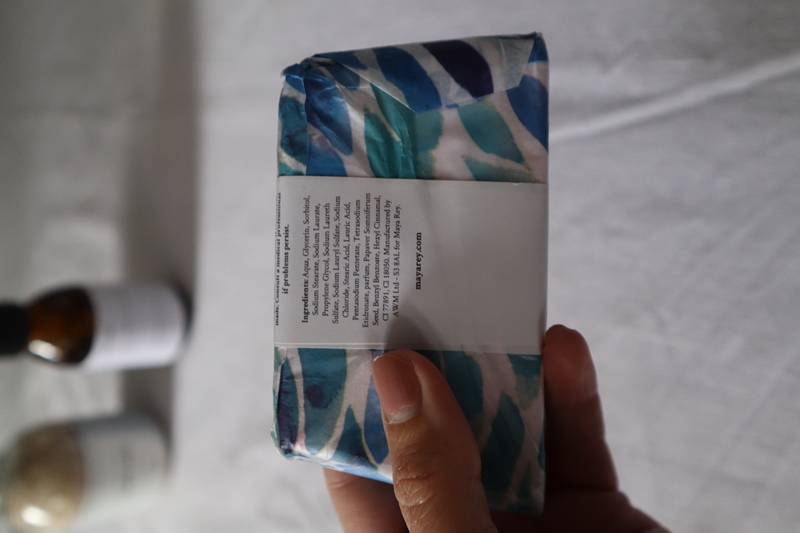 Today on the blog, I am talking about a few organic, hand-crafted soaps from Maya Rey. They send me a few products to try out. Behind the brand is a husband (James) and wife (Caroline) based in Chelmsford, Essex who create scented products promoting mindful and self-care moments while bathing. Here are my review on the products I tried. The colours of the packaging are fresh and inviting. The textures are playful between the crisp wrapping paper and the recycled cart-board chips. It is a lovely experience to open and discover. The products arrive in a completely recyclable packaging which I really appreciate. No single-use plastic here! Maya Rey is committed to being an environmentally friendly company and this is a key aspect of their company values. The smell of these bath salts is really luxurious. I personally really like Tea Tree, it is that type of smell one acquires in adulthood in my opinion, much like dark chocolate or red wine. As soon as you open this tiny bottle, you can feel its strong smell taking over. Definitely not one of these bath salt that smells artificially and bland, this one really smells multidimensional especially with the addition of the citrus lime. This is due to the fact it is composed with mineral bath salt infused with 100% essential oils. The bath salts are vegan, hand-crafted and from the Himalayas, they are really soft on the skin and dissolved pretty quickly. Who likes to seat in a bath and feels hard rocks at the bottom right ? This would be great for a full detox moment and an aromatherapy bath-time experience. I can’t imagine you would need a lot, this smells very strong and it will last a long time. I do not have a bathtub at home so I tried this product as a hand-bath (is it a thing? I don’t know, it should be because it is quite relaxing). I will definitely take this little bottle with me in my next hotel stay. It is the perfect size to add to my week-end bag. The Rock salt & driftwood liquid soap comes in a dark brown glass bottle. The liquid is transparent and again – it smells absolutely delicious. The smell stays in my hands for at least 10 minutes after I wash them. I’ve been telling my boyfriend a few times: “look, look smell my hands” repeatedly. He is a germophobe so that doesn’t bother him. The smell is fresh, clean-cut. It makes me think about a crisp morning by the sea. I really feel like It is cleansing dirty from my hands, I think it is down to the very fresh smell. This product is Made in UK. I am definitely in favour of consuming local when possible so that is a big plus. 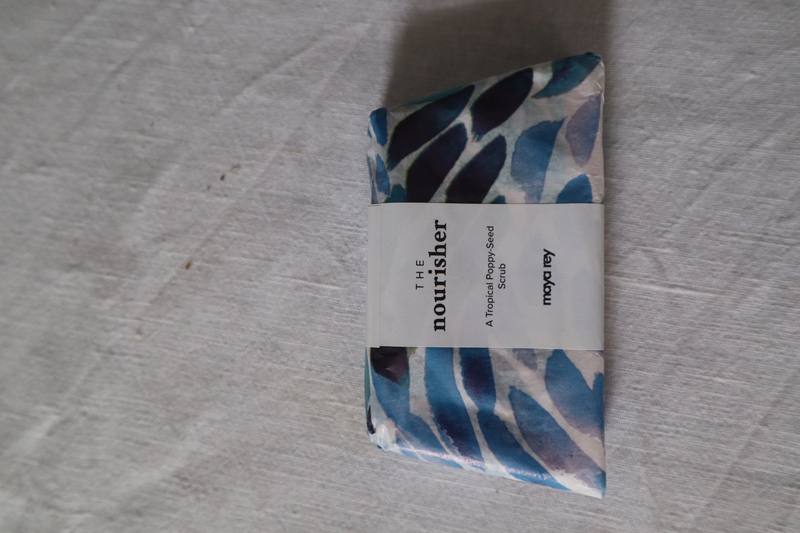 Easy on the eyes with its neon pink colour, the Nourisher soap is a fun soap to have in a bathroom and will definitely strike the eyes of visitors. It smells of tropical fruit and the poppy seeds will very gently exfoliate the skin. When washing your hands with it, you can feel the poppy seeds inside. It is quite interesting to experience. In a nutshell. 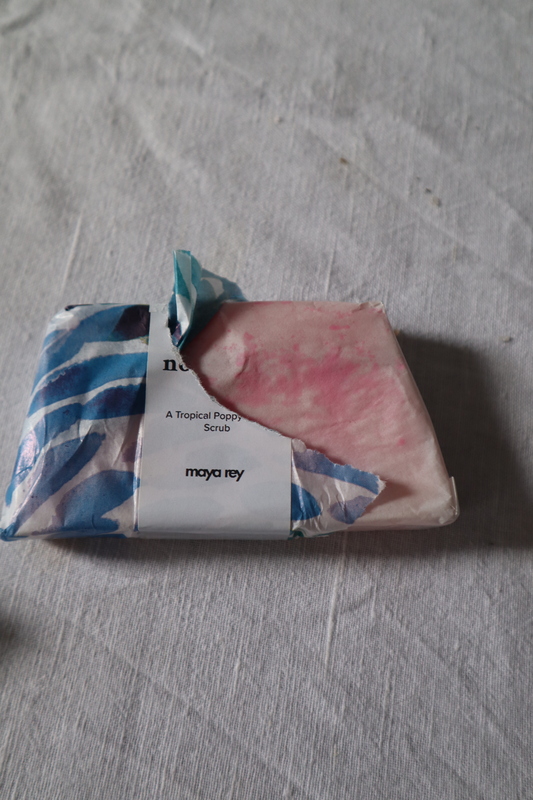 I am pleased to have discovered these product from new UK brand Maya Rey. Thank you @lovemayarey for sending these my way! These are perfect gifts (or self-gifts because we all deserve it) to anyone who likes to unwind, and relax. Visit mayarey.com for further information.